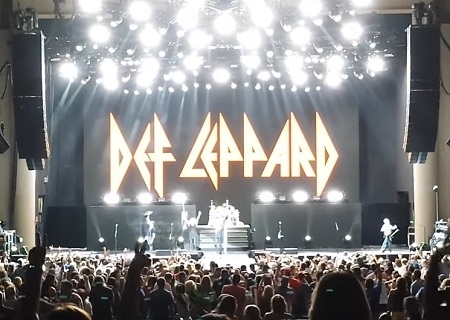 The show took place at the 24,000 capacity Klipsch Music Center. 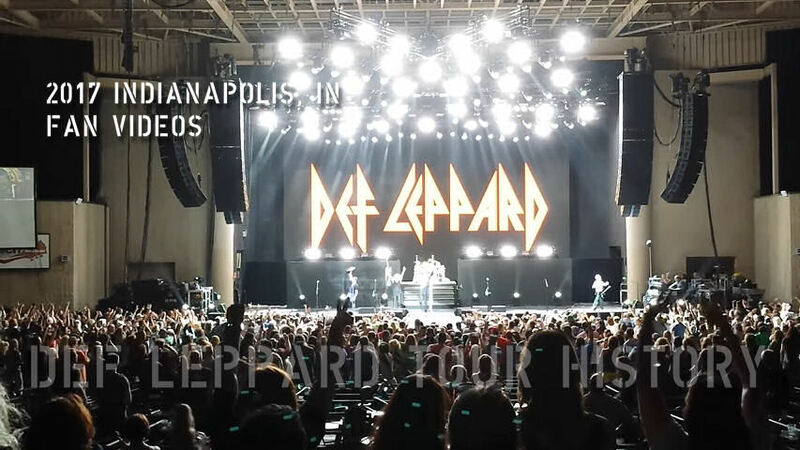 The band last played Indianapolis on 1st July 2016 on the Summer Tour 2016. The final North American show of 2017 and the summer US tour played in front of a sold out crowd of 24,000 fans. The last shows played with Poison and Tesla after 38 shows across the USA and Canada since 8th April in Manchester, NH. The 18th show the band have played in this city. The first visit here took place in August 1981 at Hilbert Circle Theatre as support to Ozzy Osbourne during the High 'n' Dry tour. Since then four indoor shows have been played in 1983, 1987/1992 (both In The Round) and 2003. This was the 11th show at this venue which has been played under three different names. It was first played as the Deer Creek Music Center in September 1993 on the Adrenalize tour. 'Man Enough' was played here for the very first time having been debuted after last summer's show. Vivian's little dog Stuart (currently loaned out as the mascot for Riverdogs...) got out on stage before Joe's Rock Of Ages speech and was quickly shooed away by Vivian. "Thank you very much. Right. Noblesville, Indianapolis, Indiana!. We've got a question for ya and it goes something like this - Do ya wanna get rocked?." "That's Stuart the dog everybody. I guess that's the end of tour joke. Well as I mentioned earlier this evening this is the last night of the tour. It makes it very emotional for us to - 'cause this is it, we're done for a while. So I think some words are in order. I'd like to thank Tesla for starting the night off for this whole summer tour. Spring and the summer tour. Tesla everybody. And Poison. Thank you guys. All of you, amazing. And just as important is our road crew. We have people on the crew that make this thing happen every night. They put it up, they take it down. They put it up, they take it down. They put it up again, You get the gist right. We've got people from all over the world. From the States. From Canada. From the UK. From Ireland. From Australia. From Japan. All doing this for us. So can we have a round of applause please for Tesla, Poison and the best f**king crew in the world!." "Thank you. Amazingly nobody - no strippers. Nothing came up on stage right. Just the dog, right. Dog, typical. And last but absolutely not least. Everybody here. Everybody here. From right down the front all the way to the back!. You guys have been amazing. This has been like. This is the best send off anybody could ask for. But like most people that you know we're tourists. We're here on a visa and we're having a lot of fun. And it's difficult for us to buy souvenirs. So what we decided to do is we take photographs of our crowd. So how about we lights down, cell phones out. Let's light this place up one last time for the band. Come on. And by the way you don't have to go quiet. You don't have to go quiet!. Look at that!. That is a beautiful thing to take home. Thank you everybody. Really, thank you. By the way we'll put it on the website so you can download it later on OK. Look at yourselves." "So where were we? Oh yeah. This noise that you guys have been making all night. This cacophony of sound that's been hitting the stage. Drowning us out almost. Amazing thank you so much. Do you think however that you can make just a little bit more?. Just a little bit more?. For this boy at the back here. Stand up Rick Allen!. He as always will introduce this one for ya." "Noblesville, Indianapolis, Indiana!. Thanks for coming. Thanks for having us. Thanks for being here. Goodnight." "What a way to end the tour. Thank you so much. It's been a real pleasure. Thank you. Until next time, and there will be a next time!. Till then do us a big favour. Don't forget us and we won't forget you. Goodnight." The next show takes place on 21st September in Rio De Janeiro for the Rock In Rio festival. Played for the first time in Indianapolis/Noblesville.